Allergy season can be a real downer when there is such beautiful spring weather outside, and unfortunately Joey and I were both hit hard this year. Joey seemed to be a little worse off than me (or maybe I just handle it better ;-) so one night I wanted to make a comforting meal for our sore throats and runny noses. I made these pretty spicy, which definitely helped clear our sinuses, but it wasn't overpowering what with the addition of gobs of cheese and sour cream. I kind of just threw them together based on what I had on hand and what sounded good, and we were both pleasantly surprised by how much we enjoyed them. Even though they are vegetarian, that doesn't mean their healthy (see: gobs of cheese and sour cream), but I topped them with freshly sliced scallion and tomatoes for a fresh finish. Preheat the oven to 375 and lightly spray a 9x13 dish with cooking spray. In a large skillet, heat the oil over medium heat, and add the onion. Cook, stirring often, until softened and translucent, 5-6 minutes. Add the jalapenos, chili powder,cumin, and salt and pepper, and cook an additional 1-2 minutes. Pour the undrained beans into the skillet with the diced green chiles, and bring to a boil. Reduce heat to a simmer and add the pickling liquid and salsa, and cook until thickened. Using a potato masher or wide spoon, mash the beans to acheive a consistency similar to refried beans. Stir in the cilantro, taste, and adjust seasonings. Add half the cheese and stir to melt. Carefully add a scant 1/3 cup of filling to each tortilla, and roll up (you may lose some of the filling, but that's okay. Just work carefully and do the best you can). 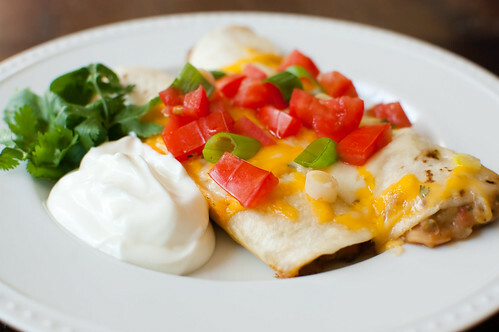 Line the rolled burritos in a single layer in the prepared dish, and top with the remaining cheese. Cover with foil and bake 15 minutes, then remove foil and continue to cook 5-10 minutes longer, until the cheese is melted. Remove from oven and cool 10 minutes, and top with scallions and tomatoes before serving. My mouth is watering even before breakfast over these - they look delicious! I agree - allergies are brutal and mine seem to be worse this year, too. Hope you're feeling better soon! 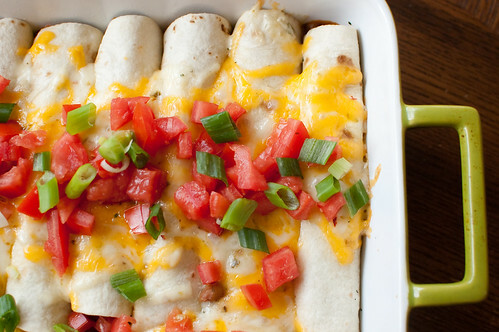 mmmm these look like the PERFECT thing to make for dinner tonight . Thanks for sharing. Mmmm I love the look of these! This would be perfect for meatless Mondays! They look wonderful. I love throwing this together like this. Sounds like you have a winner with this combination! This recipe sounds yummy, and I can always use more vegetarian dishes. I have 2 questions/teeny problems: I don't see the green chiles from the ingredients list mentioned again during prep. And I see "Pour the undrained beans into the skillet with the diced tomatoes" in the instructions, but the only diced tomatoes listed in the ingredients was for serving. Do I also need a can of diced tomatoes (or additional fresh) for prep? Thanks so much for clearing this up for me!